This is one of the easiest recipes with a quick prep time and can be served as dinner or customized as appetizers. They are a perfect addition to serve at a tasting party, Oscar night cocktail party or for a healthy family night dinner. I decided to serve mine with salad and roasted corn and peas for the hubby and I. It was a hit! The turkey came out juicy with a great mild hint of sage blended with the spinach and cheese. Start by pounding each cutlet placing a sheet of parchment paper, wax or plastic wrap on a cutting board using a meat mallet or rolling pin. Pound over the entire surface of the meat until it is 1/4 inch or less and even throughout in thickness. Essentially, you want a thinner, cutlet. Lay all the pounded cutlets out on a cutting board. Sprinkle each cutlet with salt and pepper on both sides. Then begin layering each with a sage leaf, the spinach and then the Asiago cheese. 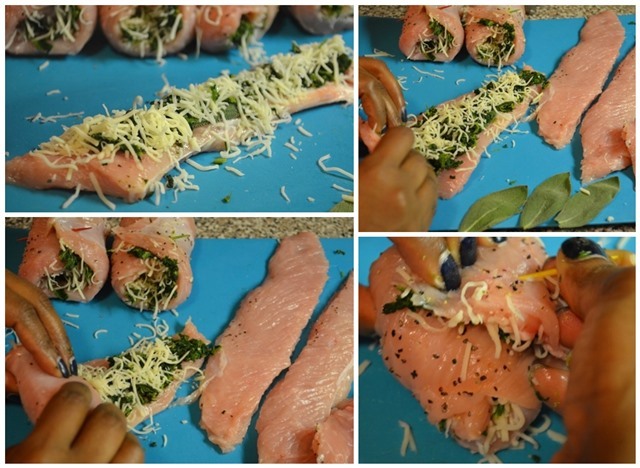 Begin rolling the cutlets tightly and away from you. Evenly insert the toothpicks 1 to 2 inches along the seam of the turkey roll-ups to hold it together on the grill. Grill the turkey roll-ups on each side for about 3 to 4 minutes or until your desired doneness. Once cooked, let sit for 10 minutes. Then serve alongside any side dish of your choice or slice each turkey roll-up to bite size and serve as appetizer. *Important: Don't forget to remove the toothpicks once the turkey roll-ups are done. I think we all can agree chomping down on a toothpick wouldn't be an enjoyable bite nor a good dinner memory.